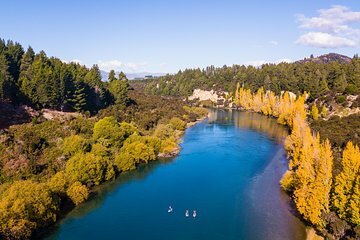 Spend the morning drifting down the mighty Clutha River on a paddleboard on this beginner-friendly tour. Spend as much time as you need getting comfortable with your stand-up paddleboard, with coaching provided by your guide, before heading down this wide and enchanting South Island river. Float down river in the shadow of lush native bush and rolling hills, and even try your hand at a few entry-level rapids. We'll drop you back off to the Wanaka Isite after the trip.